Katarina Qalomai’s earnings as a garment factory worker and then a kitchen hand at a tea house were not sufficient so she decided to run a stall at the Valelevu Market. The last 16 years she has been a vendor and with what she has been able to save she now has two of her three children attending tertiary institutions while her youngest daughter is in Class Three. “It is not easy, there have been challenges, obstacles and trying times, you just need to be deter­mined because it is your business and it depends on how you adjust and plan to get the returns you ex­pect,” Ms Qalomai said. Originally from Sawani Village in Wainunu, Bua, Ms Qalomai said there was nothing as rewarding in terms of monetary returns like be­ing a vendor. “I am not that well educated, rather than waiting for handouts this is what I must do to help my husband educate our children, put food on the table and other things,” she said. Her husband is from Keteira, Mo­ala in Lau. “Here you are your own boss. You decide on what to sell but with your customers in your mind always. “My customers are my family, I only sell the best like rourou, I only sell the best rourou not the ones you cook and scratch your inner throat. “Since I am selling rourou I also sell tavioka, coconuts, lemons and chillies because these other items go with the rourou when you are eating it. “It saves my customers’ time, they need not look around the whole market for the tavioka, coconuts, lemons and chillies. She sells at the market for six days in a week as she must take a rest on Sundays. She has two spaces at the market which she pays Nasinu Town Coun­cil $15 a table each week. 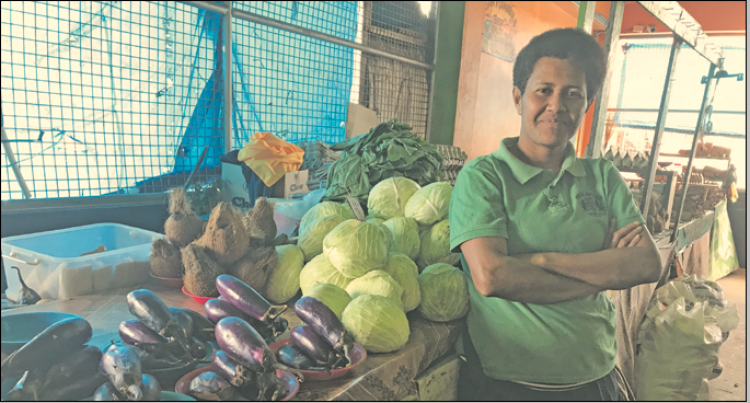 She goes to Nausori on Saturday mornings to buy her vegetables and rootcrops, if she runs short in the middle of the week she goes to the Suva Market after dropping her daughter off at school.